For additional information about this book, visit the website www.alanericsson.com. As war looms ahead, can Alan balance his two new passions: carrier aviation and the love of his life? Filled with the sights and sounds of the pre-World War II era, Sprouting Wings (the first novel in the Alan Ericsson series) pulls readers into the tensions of the daily life of our military men and women. From working with new equipment to working with the US Navy’s diverse population—and strong egos—few punches are pulled as Alan finds himself riding the forefront of technology. Having survived a submarine sinking, can Alan make it as an aviator? Will he and his new love make it through months apart as they both pursue their dreams? Can love—and Alan—survive the lead-up to war? Though Sprouting Wings is a work of fiction, it is peppered with the kind of pre-WWII historical facts and figures (complete with photographic illustrations) which will bring the story to life—whether you are simply looking for a good story or are an avid World War II enthusiast. 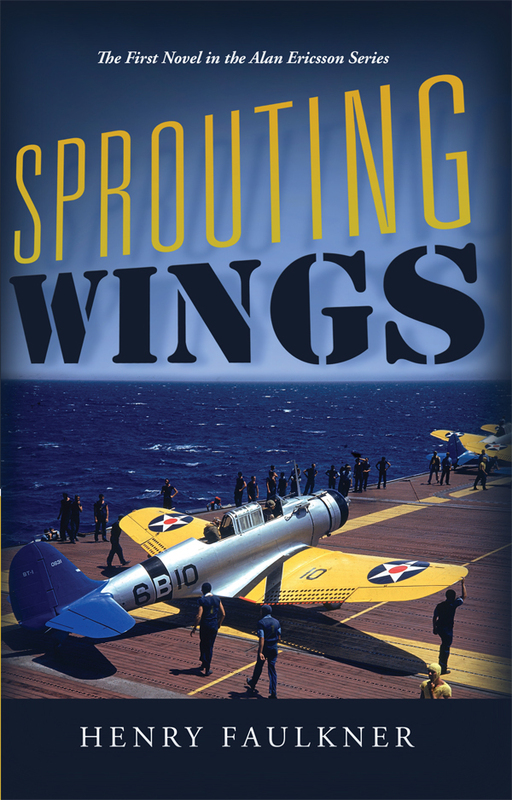 The historical novel Sprouting Wings, set in 1940-41, is to be the first in a series of five covering Navy flying career of Alan Ericsson. The military part of the story closely follows historical fact. The novel describes Alan’s background, his difficult decision to leave submarines to become a pilot, his flight training and the adventures that define his evolution from a rookie carrier pilot to a respected member of his squadron. Meanwhile his chance meeting with a woman he has long admired leads to his courtship and marriage. She works for the Office of Naval Intelligence, providing another perspective on unfolding world and naval events. She makes the difficult decision to transfer to Pearl Harbor in August 1941 and is present for the Japanese attack in December. Through the novel, the drumbeat of war news from Europe, joined by increasing hostility toward Japan after July 1941, creates a background of increasing likelihood of war for the U.S. and combat for Alan. During the 1960s and ‘70s, author Henry Faulkner worked as an aeronautical engineer in airplane structural design, aircraft conceptual design, and air transportation planning. He took up flying and was able to get experience in flying World War II aircraft, complementing his study of the history, while enjoying personal air transportation. He and his wife live on a colonial farm in Dover, Massachusetts. Sprouting Wing is his first novel in this five-book historical series.